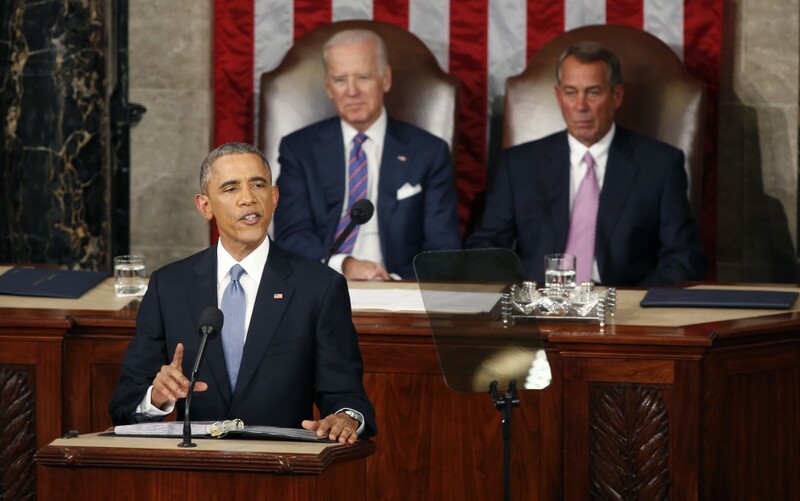 In Tuesday’s State of the Union address, President Barack Obama celebrated “middle-class economics” and laid out a series of additional proposals to ensure the working class is included in the economic recovery. Most significant among them is his plan to raise taxes and fees for the wealthy in order to give working families a break. The White House released details of the plan over the weekend, giving GOP lawmakers plenty of time to suggest it won’t get very far now that they’re in control of Congress. The president again called on Congress to raise the federal minimum wage, after urging Congress to “give America a raise” in 2014. Earlier last year, he signed an executive order for federal contractors to be paid $10.10. Without any Congressional movement on the issue, however, states and cities across the country adopted their own higher wages. “It’s time we stop treating child care as a side issue, or a women’s issue, and treat it like the national economic priority that it is for all of us,” he continued. He touted the economic progress the country has made since the recession, especially improvements in the labor market, and thanked Vice President Biden for his work on job training. A federal job retraining program was one of only two proposals from Mr. Obama’s 2014 State of the Union that Congress passed last year. Mr. Obama also called on Congress to pass a bipartisan infrastructure plan, which, he suggested, would create 30 times more jobs per year than the Keystone XL Pipeline. New this year is Mr. Obama’s proposal to make community college free to all Americans who maintain a 2.5 GPA, a plan he first debuted on the road in Tennessee earlier this month. The economic backdrop for Mr. Obama’s sixth State of the Union looks and feels different from when he first addressed Congress six years ago in the midst of the Great Recession. The unemployment rate has declined from 7.8 percent in January 2009 to 5.6 percent last month, its lowest since 2008. The past year has been the best for job creation since 1999, while on Wall Street, stocks are surging, with the Dow now well over 17,000. This is the first time Mr. Obama is addressing a Republican-controlled Congress — a reminder for the Democratic president that the booming economic indicators over which he’s presided haven’t necessarily translated into prosperity for all Americans. Two-thirds of voters in last fall’s midterm elections told exit pollsters the economy was getting worse. Although they largely rejected Democrats at the ballot box, voters in otherwise conservative states embraced liberal ballot initiatives — like raising the minimum wage — that would cushion their pocketbooks. That was a sign that while the health of the labor market has improved significantly, American workers haven’t seen much of a raise. Wages are barely keeping pace with inflation. And there are still nearly 3 million long-term unemployed. Since the election, falling gas prices have put some needed cash back in Americans’ pockets, while revised GDP numbers for the third quarter put economic growth at its fastest in a decade — both improvements that some have credited with boosting Mr. Obama’s approval rating to 50 percent in the latest Washington Post/ABC News poll. Mr. Obama will further detail his economic proposals when he delivers his budget to Congress on Feb. 2.